In 1957 Christian aid launched Christian Aid Week to help fund their ongoing work. None of their work would be possible without the tireless dedication of volunteers. 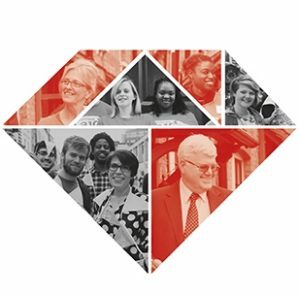 As they mark the diamond anniversary of Christian Aid Week, they are also celebrating these amazing people. Joan McKichan and Jean Cooper. For many years, between them, they have organised the Christian Aid week collections, services, soup lunches, quiz nights, dances and other sponsored events, such as walks along the Deeside railway line. These things don’t just happen and as we all know Jean and Joan just work away quietly in the background and organise. However on the odd occasion they bring firmly to our attention the need for our support for disasters and emergencies, and we then follow their lead and contribute to the ongoing work of Christian Aid. Well done to Joan and Jean for gaining these awards and I know that they would both say that they are receiving them on behalf of all the Woodside volunteers who have contributed over the last 60 years of Christian Aid Week Fundraising. 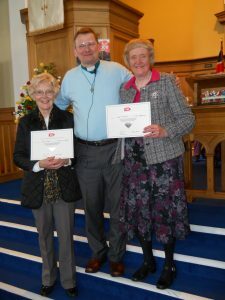 Long term certificates were presented to two of our wonderful church ladies, Joan McKichan and Jean Couper at the service on 14 May 2017. After the service at the end of Christian Aid week a soup lunch was served in the church halls. The pictures are of members of the congregation at the lunch.